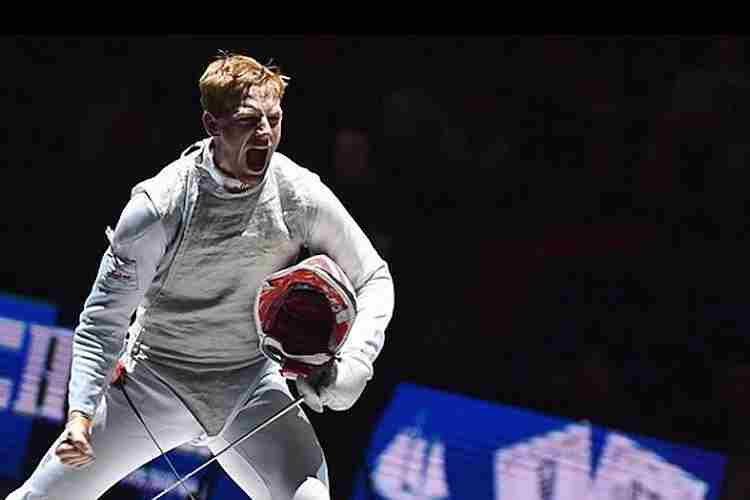 The international fencing schedule features three Grand Prix events during the season, the most highly-prized tournaments outside of the World Championships for many fencers. That made American Race Imboden’s win at the Foil Grand Prix in Turin especially satisfying. Not only did he win his second career Grand Prix, but it was his third medal in an FIE World Cup or Grand Prix in a month and moved him from no.3 in the FIE World Rankings back to no. 1. Along the way, Imboden defeated 2018 World Champion Alessio Foconi of Italy, 15-13, in the semis. He then beat a surprise finalist in Ka Long Cheung of Hong Kong, who earned his first career Grand Prix medal and his first medal in a worldwide competition in two years! There was more good news for the U.S. in third as Gerek Meinhardt won a bronze medal, and moved into the FIE World Rankings top-10 at number nine. It was his first Grand Prix medal in five years, but he had won a World Cup silver in Paris in January, so he is trending up once more. Two more FIE World Cups were held, both in Epee. Japan’s Koki Kano won the men’s tournament in Vancouver, defeating Enrico Garozzo (ITA) in the final. It was Kano’s first-ever World Cup win and his second World Cup medal this season. American Jacob Hoyle, 24, won a bronze to go along with his Grand Prix bronze earlier in the year; he’s suddenly moved up to no. 9 in the rankings. Men’s Foil: 1. Race Imboden (USA); 2. Ka Long Cheung (HKG); 3. Alessio Foconi (ITA) and Gerek Meinhardt (USA). Semis: Imboden d. Foconi, 15-13; Cheung d. Meinhardt, 15-12. Final: Imboden d. Cheung, 15-6. Women’s Foil: 1. Alice Volpi (ITA); 2. Elisa Di Francisca (ITA); 3. Anastasia Ivanova (RUS) and Francesca Palumbo (ITA). Semis: Volpi d. Ivanova, 15-12; Di Francisca d. Palumbo, 15-7; Final: Volpi d. Di Francisca, 15-9. Men’s Epee: 1. Koki Kano (JPN); 2. Enrico Garozzo (ITA); 3. Alexandre Bardenet (FRA) and Jacob Hoyle (USA). Semis: Kano d. Bardenet, 15-8; Garozzo d. Hoyle, 15-14. Final: Kano d. Garozzo, 15-7. Men’s Team Epee: 1. Russia; 2. Israel; 3. France; 4. Denmark. Semis: Russia d. France, 45-33; Israel d. Denmark, 45-42. Third: France d. Denmark, 45-32. Final: Russia d. Israel, 45-36. Women’s Epee: 1. Man Wai Vivian Kong (HKG); 2. Hyein Lee (KOR); 3. Kristina Kuusk (EST) and Aleksandra Zamachowska (POL). Semis: Zamachowska d. Lee, 15-7; 2. Kong d. Kuusk, 15-11. Final: Kong d. Lee, 15-12. Women’s Team Epee: 1. Poland; 2. Russia; 3. China; France. Semis: Poland d. France, 36-29; Russia d. China, 42-36. Third: China d. France, 45-38. Final: Poland d. Russia, 45-40. Next article LANE ONE: Could Kasper’s outburst lead to a reduction in the size of the Winter Games?